We're now entering the second week of excellent behavior by Moody, which is great! We call it "going up the maturity ladder." He relates to such constructs pretty well; he added once that he is going "down the being bad ladder." Last Saturday he had his second ice skating lesson, and it was wonderful! The first lesson, he basically spent the whole time grabbing on the edge, but he moved a little and didn't get frustrated. The coach suggested moving him to a beginner class, where, I discovered afterward, the kids skate with parents. Well well well! Oddly enough, it was only my second time ever to put on skates, Moody's third. I got to the slab of frosted glass and decided: FORGET THIS! Well, Moody was cool, he went in with some sort of "advanced beginners" class where the're supervised by a couple of teens. I was pleasantly shocked. Moody stayed the whole time away from the edge, wiggling and jiggling and even falling at times, but he could get back up! He was happy, I was thrilled and relieved. Whew! 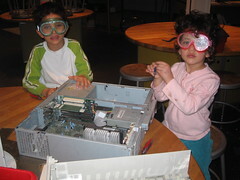 Last Friday Hanu and the kids went exploring science and technology at the Center for Science and Industry, COSI. (I suppose if they'd put the word technology in the name, instead of industry, then COST wouldn't make a very appealing acronym.) The name sounds like cosine-- ooh, very sciencey! Anyway, the guys had a blast exploring space, playing doctors, and hands-on stuff like bugs and crabs and doing a surgery of sorts on an old computer. They took out its "brain," a big old Pentium II beast. The CPU is mounted on a spikey aluminum platform for keeping it cool. 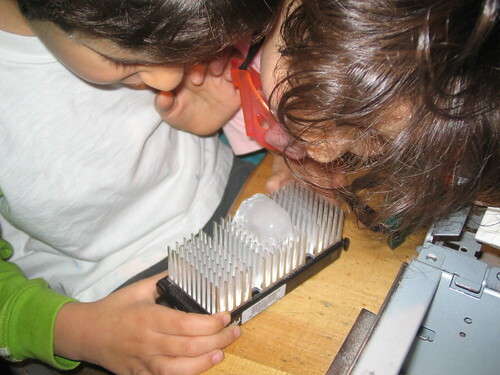 The kids put an ice cube on the spikes and watched it melt quickly and sink down. Now they probably think the function of computer brains is to melt ice, which is not doing much to their technology education but hey, they can at least get some good science fiction out of that! I'm proud to say Moody can distinguish five different kinds of materials: metals, plastic, glass, ceramics and wood. I can't wait till we can get inside those and talk microstructure! He is becoming very interested in building stuff and experimenting. Tala? Well, take a look at her picture observing the ice cube experiment. Is she involved enough, you think? LOL LOL LOL What a nosey girl! It's interesting how technology affects people of all ages, but I think its influence on kids might be the most vivid. I am sure Tala and Moody don't relate to things the same way my generation does. I wonder what they think when they see a clunky toy phone with a dial and a cord. It must fall in the same category as a potato with glasses. And the whole computer thing. I grew up to think of the computer as just that, a thing that is programmed to compute and solve problems numerically. I am sure Moody and Tala think of it as a tool for playing games, viewing pictures and shopping! The other day, I had the kids in the car and made a left turn at a light. Tala said,"Hey, Dad, you goed on red!" I said, "I had a green turn light." A short while later Tala was telling me, "I sawed the click, Dad." I asked for clarification, but she just kept talking about seeing the "click." Finally, it dawned on me that she meant the ARROW of the traffic light. She called it a "click" because of the arrow on the mouse, the one you "click". I was hilarious! But then I thought, why do we call a pointer "an arrow." Because we linguistically belong to an ancient culture, that's why! For Tala, a member of the finger shopping species, it's the click! Just imagine pulling up a dead person even from the sixties and how they might interpret phrases like "move the arrow and click the mouse, then drag it." Distasteful rodent hunters!